Lively discussions are an important part of the annual Sustainability Dialog in Stuttgart. In addition to the traditional workshops covering a wide range of sustainability topics, this year's event focused on measures to improve urban mobility. The evening before the 9th Sustainability Dialog in Stuttgart kicked off with open, helpful, but also controversial discussions. "If we plan to meet the Paris climate goals, traffic must become cleaner", guest speaker Peter Bakker from the World Business Council for Sustainable Development explained to the audience. 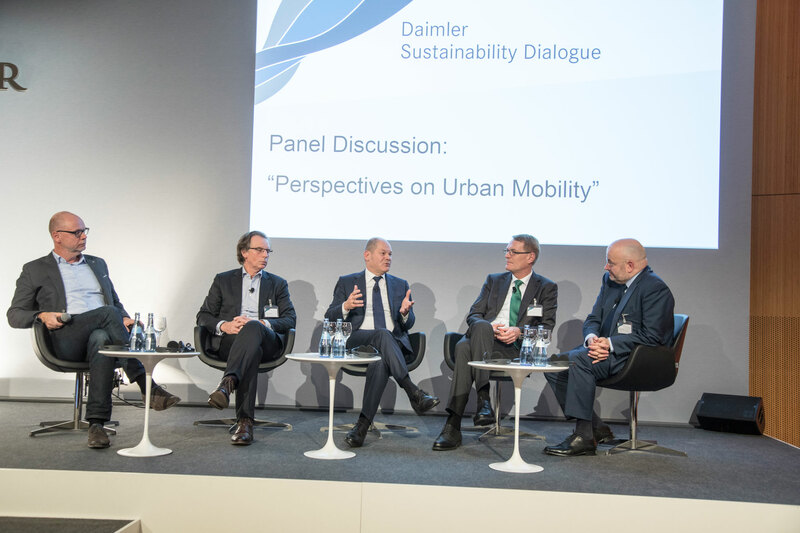 It was already the 9th occasion that Daimler employees exchanged ideas with representatives from politics, science, and society on subjects including urban mobility, climate protection, digitalization, and human rights. For this purpose, around 200 representatives from science, politics, trade unions, associations, and non-government organizations (NGOs) came together at the Mercedes-Benz-Museum. Bakker went on to explain that a change within the traffic sector was desperately needed as the number of vehicles registered around the world would double by 2050 to 2.5 billion vehicles. However, we would only achieve this "if cities and businesses closely work together", Bakker continued. Olaf Scholz, Major of the City of Hamburg, also emphasized the significance of improving the air we breathe in his speech: "we must find solutions to improve the air quality in German cities." However, bans such as those currently discussed for diesel vehicles were not an option. "I consider this approach to be anti-social", he adds. People with low incomes were often unable to afford vehicles with the most recent emissions technology. Scholz considers it more important to electrify public transport, taxis, and deliveries in inner cities. Thomas Weber, member of Daimler's Board of Management and responsible for group research and Mercedes-Benz Cars development, sees electric mobility as the only way forward in the long term. He gave a sneak preview of our automotive future with the Concept EQ show car. The smart ed has been on the market for years and in spring 2017 it will be succeeded by the fourth generation of electrified smart vehicles. It will be available as a Coupé, Cabrio, and four-seater vehicle. As part of the subsequent panel discussion, Hartmut Schick, head of Daimler Buses, described the plans for electrification. He went on to explain that especially within the Bus division Daimler was already able to fall back on many years of experience – also in collaboration with the City of Hamburg – and many millions of kilometers. By 2025 Schick envisages electric buses with a range of up to 300 kilometers – enough to master a day's work within inner-city traffic. Klaus Entenmann, responsible for mobility services at Daimler, among other things, referred to the moovel app customers can already use today to combine several means of transport and conveniently pay using their smartphones. "The pioneer of carsharing, car2go, verifiably improves urban mobility and contributes to boosting quality of life", Entenmann quoted from a new study by the University of Berkeley, USA. Participants of the panel discussion all agreed that only direct collaboration between politics, society, and industry will lead to improved urban mobility. Daimler CEO Dieter Zetsche kicked off the main day of the Sustainability Dialog. His key note focused on the required change processes within the company and the future of electric mobility. "Now is the time to fully immerse ourselves in electric mobility", Zetsche explained. Battery costs are dropping and ranges increasing. However, he was also convinced that electric mobility would not make a breakthrough as a result of bans, but rather by sparking a passion for vehicles. 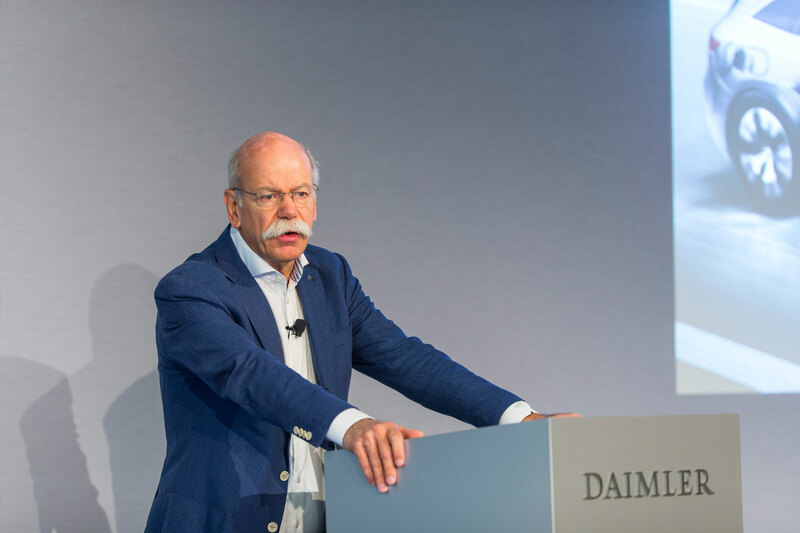 Zetsche also emphasized that drivetrain electrification would not be the only change within the automotive industry: connectivity, autonomous driving, and sharing models were developments that were just as important. In different working groups, participants subsequently discussed topics such as air quality in cities, scenarios to measure emissions in real driving conditions, human rights, autonomous driving, data protection, and social responsibility. Thomas Weber attaches particular importance to these discussions: "they are very helpful, straight-forward discussions. I am happy that we were able to once again discuss the questions of the future this year. This also makes us better." Renata Jungo Brüngger announced the continuation of the dialog series: "I am sure we will organize a tenth dialog. The discussions are very valuable for the development of our commitment to sustainability."